ONLY $84 Always at least $10 less than anywhere else! MuseNames is the world's largest commercially available database of names, containing more than 40,000 names from over 70 ethnic origins. Designed especially for fiction writers, this software allows the writer to quickly find the perfect character name - by gender and starting and ending letters, as well as by meaning (to match the character's personality and role in the story) and by origin (to match the character's ethnic background). 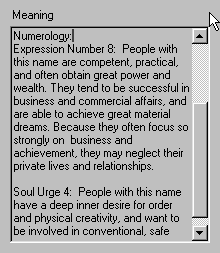 Each name also shows a numerological analysis of the name, adding another powerful tool for matching (as well as generating ideas for) the personality traits of each of your characters. And when you're not using it to write stories, you can use it to find the perfect name for your baby. For years, both fiction writers and expecting parents have searched through print-based name books, frustrated by the limitation of the print media. You want a name for a character in a fiction novel that will reflect his evil nature. Or you want a name for your female baby that will mean "beautiful" or "gifted." Even with half a dozen printed name books to search though, the fact is that name books are organized alphabetically by name and sometimes by origin, but print media name books are not organized by meaning. And they don't allow you to search every word. You want more than a dictionary of names - you want to be able to type in "beautiful" and see a selection of names meaning beautiful, considering each name with its meaning and numerological analysis giving personality characteristics. 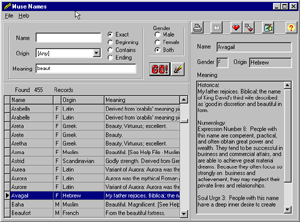 The database can be searched by Name, Origin, Gender, and Meaning. A name search can be made with options set to find an exact match, or to search for names beginning with specific letters, ending with specific letters, or containing certain letters. Search results are viewed in a table, with the selected record and its numerology analysis shown in a separate window. Search results can be printed. A numerology reading is given for each name, providing insight into character traits that a person by that name may exhibit. Numerological calculations have been done on names in order to calculate the meaning of different names since the time of the Greek mathematician Pythagoras, about 2500 years ago. Muse Names uses the Pythagorean method of numerology, the most common in use among numerologists. Muse Names performs two numerology calculations on each name in the names database. When you review the results of a names search, these two numbers are shown in the View window to the right of the Search Results listing, along with a description of their significance. An Edit Database Records function allows users to add names to the database, as well as to alter database records. This allows users to add additional information about specific names if desired. In addition, favorite names can be added to a Favorites database, allowing the user to study and edit favorites at leisure. Your favorites list can also be printed. 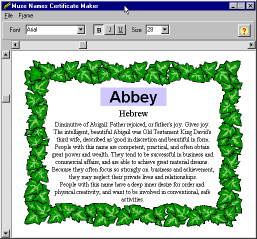 Print a graphics quality certificate on portrait or landscape paper with name, origin, historical and numerological meanings, using the provided frames - or use your own graphics as frames! Font styles, sizes and colors can be changed, Frames can be changed or eliminated. MuseNames comes with half a dozen frame graphics. You can also use borders and frames or even whole pictures from your own clip art collection (.BMP or .WMF files). The possibilities are limited only by your imagination., Name, origin, and meaning fields can be removed or edited for various certificate needs, such as birth announcements. MuseNames is a 32 bit program designed for the Windows platform. Requires Windows 95, 98, 2000, NT4, ME, or higher; and 50mb of available hard disk space.